Our relationship with our gardens is changing. Time-poor families want to spend precious spare time playing and relaxing together, and are investing in low-maintenance outdoor spaces which are high on entertainment value. An awning allows you to seamlessly extend and connect your indoor and outdoor living space. 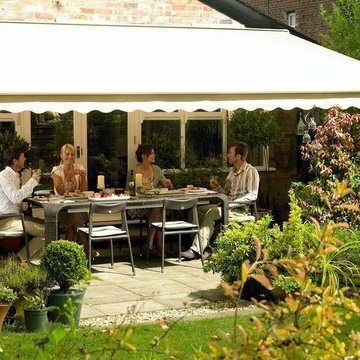 Your awning is fitted directly to an exterior wall, so you can walk straight out of your living or kitchen area into a stylish, covered outdoor dining space. A stylish awning helps you enjoy café culture in the comfort of your own home. Choose from a range of classic striped or plain designs and customise with straight or scalloped hems and create a relaxed, continental feel. An awning is a fantastic way to make the most of the outdoors without taking up valuable floor space. Your awning will provide you with shelter as you dine in comfort, and when not in use, your awning rolls neatly away into a wall-mounted cassette. Your awning can be fitted with intelligent sun sensors which will automatically extend your awning when the sun is at its hottest. And all our awnings come with vibration wind sensors as standard, so when the weather becomes too blustery your awning will retract safely into its cassette, avoiding potential damage. Forget smoky chimineas and bulky patio heaters. With an awning you can include integrated heating and lighting so that you can enjoy al fresco dining into the wee small hours in supreme style and comfort.